Tree Planting With Feed Inc.
Last Saturday, I joined some people from the offsite ministry at church to a tree planting weekend with FEED Inc. at Siniloan Laguna. I have been craving some time out with nature and I figured a short trek in the woods to plant trees would do me some good. We set to meet at Jollibee Molito and leave at 5:30 am to meet the organizers at 11 am in Laguna. Since I have not slept after working the night before, I took the opportunity to catch some z’s while traveling. Upon reaching our destination I had enough energy to face the day ahead. I am not 100% sure what the place we went to was called. I remember the forest guard mention Laguna-Quezon Land Grab during our orientation so let’s call it LQLG. After the orientation and some pre-trek photo op, we made our way towards the part of the land where 1,000 plants were waiting to be planted. A man showed us what to do with the plant and how to bury it properly. Dianne from FEED told us that each person should plant one tree a month for five years, that is the quota. That’s 60 trees in five years, which is not bad. During our trip, each one should be able to plant 35 trees, I was only able to plant 15. Some of the people with us worked too fast and covered more trees than they should have. I’m not complaining though. I enjoyed the little time I spent planting trees knowing full well that what I’m doing will benefit the future generation. I was only a little disappointed with some participants. Some plants weren’t buried properly. How did I know? We noticed while passing through some that the soil had air and could use more squeezing. We figured the men would check our work and secure the plants better. It’s a waste of effort though, we were already there and the participants should have made sure they were doing it properly. Oh well. On our way back to the assembly hall, I felt so tired already. It must have been the walk and the heat and maybe the hunger too. We had lunch binalot style with chicken and pork adobo with egg and tomatoes. As we prepared to leave, we were presented with certificates and more photo ops. I don’t have a copy of the group photo with certificates yet. The total cost of our trip, sans transportation, was only Php 550 and it was so worth it. I had fun, I learned and experienced something new that will benefit every living thing, and I had my nature fix. God is great indeed! 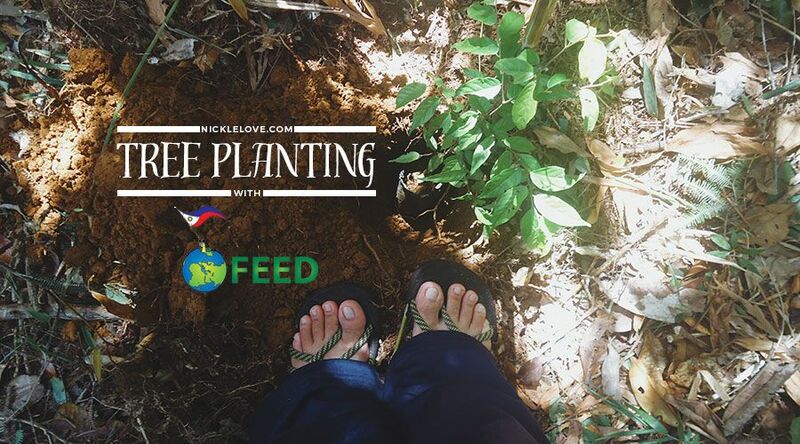 To learn more about FEED, their advocacy, and how to join their tree planting events, check out their website at https://feed.org.ph/ or follow their social media. Oh! I love planting things~ Although, we only plant, well, plants, flowers and such, not trees because we don’t have enough land to plant trees as well. I want to start a self-sustaining garden but don’t have the space. I can probably do herbs hehehehe. I also want flowers for beautification.